God’s Grace | Joe Quatrone, Jr. It is no small wonder these two verses are frequently memorized. They sum up the gospel of grace. Every heart’s desire is grace. We surely don’t want justice. If we got what we deserved for our sin, we would all be condemned. We want what we don’t deserve and that is grace. Ephesians 2:8-9 teaches our salvation has nothing to do with our works. It is a free gift from God which we receive by faith. Salvation is not something we work up or even work on. Works have nothing to do with it. If that were the case, we could boast, “I did this,” or “I did that.” But only God can say, “I did this: I provided what all these sinners need through My Son.” Even the faith to believe comes from God, so it is grace from start to finish! Paul knew about boasting. In Philippians 3, he referred to his past. It was quite an impressive past too! Talk about religious credentials! He was impeccably religious. He was “circumcised on the eighth day, of the people of Israel, of the tribe of Benjamin, a Hebrew of Hebrews; in regard to the law, a Pharisee; as for righteousness based on the law, faultless” (vv. 5-6). If anyone could boast or have confidence in the flesh, it was him. But he looked at his impressive past and counted it all rubbish: “I consider everything a loss because of the surpassing worth of knowing Christ Jesus my Lord…” (v. 8). According to Romans 3:23, none of us deserve salvation: “for all have sinned and fall short of the glory of God.” But God’s grace is greater than our sin. All we need to do is confess our sin and trust Christ. If we think any of our works add anything to the Cross, we insult God. Have you ever looked at your circumstances and thought, I would love to have a chance to do that again? Or If I could just change that, I would. I need another chance. That is what grace is all about. I don’t mean after we die, we get another chance to receive the Lord Jesus as Savior. The Bible does not teach that. I mean in this lifetime God lavishes His forgiving love on us after we have thoroughly blown it. We are never outside God’s grace! Most people hear the gospel many times before they receive the Lord. That is grace. God does not give up on wooing us to Himself. He is the God of second chances – and oftentimes a thousand chances. He sends someone our way to tell us of the Savior. We reject the truth. But because He is the God of grace, He sends another. We reject the truth again. Because He is the God of grace, He sends yet another. Sometimes, this process goes on for years until finally one day – because of pursuant grace – we become children of God. This should encourage us to pray for unsaved people. This should encourage the Christian wife who has prayed for years for her unsaved husband. God’s grace is pursuing him. This should encourage parents who have been praying for their unsaved child. God’s grace is pursuing that son or daughter. We may give up. God does not. Some of us were saved early in life and some were saved late in life. But the wonderful fact is it takes the same amount of grace to save a five-year-old boy as it does a sixty-year-old man. Grace is abundant, no matter the age. Many struggling Christians understand they have been saved by grace, but they still want to pay God back with good works. Some even think this is necessary to remain saved. The Bible teaches neither. God’s love for us flows from His character, not ours; it is not dependent on anything we have done or will do. In fact, if we do nothing to serve Him for the rest of our life, He will not love us any less. I have a friend who reacted negatively when I told him he could not earn his way to heaven. He could not comprehend this kind of grace. He felt he had to earn God’s love and acceptance. In time, however, he was able to accept God’s unconditional grace and an enormous burden lifted off his back. After accepting this truth, he found that he still wanted to serve God, but his motivation was different. He served God because he loved Him, not to earn His approval. This is certainly a liberating truth! God isn’t keeping score. We can’t pay Him back for His grace. No amount of good works can pay the debt we owe. It is only by God’s grace through faith in Christ that we are saved. We can’t do anything to make Him love us anymore (and we can’t do anything to make Him love us any less either!). The book of Galatians was written to those who were adding law to grace. Paul wrote, “Therefore the law was our tutor until Christ came that we might be justified by faith. Now that this faith has come, we are no longer under a tutor” (3:24-25). There is no way we could keep God’s moral code perfectly. We need a Savior. Even after we become Christians, God does not want us to add law to His grace. He wants obedience, of course, but the obedience is an overflow of a heart full of love, not legalism. When Jesus tells us to keep His commandments, He emphasizes that obedience shows others we love Him. The moral law shows us our need for a Savior. The corresponding imperatives in the New Testament help us see we cannot obey the Lord Jesus, even after we are saved, without His help. It is not ought to, should, and must to gain His favor. Rather, it is children wanting to please their heavenly Father because they love Him. This delivers us from legalism and keeps us on the ground of grace, not only for salvation, but also for living the Christian life. Grace brought us to the Savior, even after we spurned Him on many occasions. Grace brings us back to Him when we fail. Grace lavishes us with all the things we need to live for Him. Grace implores us to do good works out of sheer gratitude. Grace displaces us when we test the limits. Grace tells us we’re accepted. Grace is more than what we need when we suffer. Grace super-abounds where sin abounds. Grace invites us to God’s throne where we find help in times of need. What about those who abuse God’s grace? Paul asked and answered this very question: “Shall we go on sinning so that grace may increase? By no means! We have died to sin; how can we live in it any longer?” (Romans 6:1-2). The implication is that it is unthinkable a Christian would be comfortable continuing in sin. Sin does not stay dormant. It grows. It enslaves. If we are saved, sin cannot destroy our relationship with God, but it surely can damage our testimony and our fellowship. If you are struggling to earn your salvation, please know God’s grace is all you need. We become Christians through God’s unmerited grace, not as the result of any effort, ability, intelligent choice, or act of service on our part. This entry was posted in Topical and tagged Devotions, Eternal Security, Forgiveness, God, Gospel, Grace, Jesus, Love, Salvation. Bookmark the permalink. It is significant that God so often uses marriage as the metaphor for our relationship with Him. I think we would pretty much all agree that in a marriage the husband and wife do things for each other out of love, not out of duty or trying to gain favour. In fact, when we see a marriage where, say, the wife is continually trying to earn her husband’s love, we feel sad and see it as less than a marriage. How odd then that we turn around and try to earn God’s love! This is a keen insight! Thanks for sharing. My very thoughts exactly! I’ve used this same comparison myself when describing why we do “works” – because we love, not to earn points. Thank you, my brother. To God be the glory! Beautifully stated! Thanks for your insight, Joe. God loves each of us for who we are and what we are. There is nothing we can do to get Him to love us more than He already does! Blessings, Dave. I am that “Christian wife” praying for her husband, thanks for mentioning that! I have to re-blog this because just this morning I was overwhelmed with frustration over Christians pointing fingers at the sins of others as evidence to doubt their salvation. Also, there seems to be a strong movement towards “works” as a part of justification, which again is erroneous. God needs nothing from me, and there is no work I could ever do to be worthy of salvation or “prove” my salvation. The problem is, there is a misunderstanding of grace. To the believer who truly understands the grace of God, they are compelled to act. The believer who has not appropriately understood grace strives to do good works because “the Bible says so” rather than being compelled to do them out of a heart that is in LOVE with God and His grace towards them. All of our Christian striving to “do good” would be eliminated if there was a desire to understand grace as God meant it. very nicely stated, young lady!!!!!!!! Thank you, Rebecca. I know it can be frustrating for your husband to “not see the Light” as you have. I encourage you to keep praying and be a light to him through your actions at home. God’s grace is powerful! One day, he just might become God’s child too! Thankfully, as you pointed out, we could never earn our salvation. Our righteousness is not our own, but that which has been given to us through Christ’s perfect sacrifice on the cross. My prayers are with you, Rebecca! Thanks for your prayers, and I’m always “hanging around”. 🙂 My dad was a preacher, and we used to have many long theological talks so I learned how to study the Word at an early age. (Although I struggled for sometime to LIVE what I studied). Being in Gods family means I’ll be a student of truth until I’m perfected in His presence! hi rebecca,…my settings??? or yours??? won’t let me view your page??? any ideas??? Thanks for reblogging my post, Rebecca. The more people who come to know God’s grace the better! Hi Rebecca, I hope you are well! I haven’t heard from you in a while. How are you doing? I no longer see a link to your blog on your name. Did you change the URL or something? Do you know I am editing/co-authoring a devotional book? Great article my brother. God’s grace goes beyond human thinking and reasoning. All we can offer as human is conditional love and grace. Only through a relationship with Jesus we can tap into the unconditional kind of grace and love. Have said all this we have to be aware that once saved does not mean always saved. Through constant disobedience and living a life which pleases the flesh rather than God will only show that that we are still of the world and as scripture says you cannot serve God and the world. Those who sin deliberately will become enemies of God even though they would have at one point in time accepted Jesus. “Only through a relationship with Jesus we can tap into the unconditional kind of grace and love.” Amen! I don’t deserve God’s unconditional grace and love, but He gives it to me anyway. This is amazing! Thanks, Joe, for sharing this. lol joe!!!!! good stuff!!!! !,…….but now,….i have to wonder if the standard once saved always saved,..or not,…arguments are about to begin? i hope not. lol,….GOOOOOD MORNIN TO YA, JOE!!!!! AND THE REST OF YALL TOO!!!!!!! I’ve noticed that any Scripture taken out of context and in disregard for the audience intended by the original author can be used to twist and distort one’s beliefs about any number of things. There are many verses that “appear” to support loss of salvation, but when viewed in the entirety of Scripure, simply cannot be so. To say one can lose their salvation is to say the entire book of John is blasphemy. Very true, Rebecca. Personally I think the problem of once-saved-always-saved or not is one of perspective. From God’s perspective it is probably true that those who are really saved are always saved, but from our partial perspective it doesn’t always look that way. Since we cannot see the heart (as God can) we must be gracious, and that means we must attribute salvation to those who appear to be saved. We don’t always get it right and so it can seem that some lose their salvation. well howdy joe!!!!!! i have some thoughts, i have some thoughts!!!!!! can i throw em out here now!!!!?????? ?………can i, huh??????!!!! by the way,….WHAT A SERIOUSLY GREAT BUNCH OF PEOPLE ARE COMMENTING ON HERE TODAY!!!!! HUH??????? ?………much love to all of you!!!!! form someone who you will 99.9% chance,…..never ever meet!!!!!????? it’s a funny thing being a part of a worldwide spiritual body,….isn’t it!!!???????? it’s kinda like when we can’t lick our own elbow,……….even then,….we are STILL PART OF THE BODY OF CHRIST,…………….that’s pretty cool when we look at it just right, huh????? yup,..the nose, never sees, the back of the head to which it is attached!!! we are all so different,….yet desiring the same. there is love here my bro joe!!!! where two or more are gathered in HIS NAME,…..HOW’S THE REST OF IT GO FOLKS?????? I hope this links correctly – I agree with what our host said below: Were they ever saved to begin with? Love for God is such a wonderful motivation! perfectly said through an understanding of an all accepting loving true faith!!!!!!!!! also written by a very real human??????? nice! very nice………………. Great post , great message and glory to God , thanks Joe. Joe, I was just reading 1 John this morning and agree with your assessment. Most likely (though we couldn’t know for certain) those people were never saved to begin with. I still believe, however, its not my place to “judge” a persons heart. My husband assures me he “believes in God” but his lifestyle says the opposite. I pray for him, and I serve him as his wife, but I don’t preach at him. I love 1 John 4:18-19 which tells us to love in DEEDS not just in words. That is the key and how people will be brought to Christ; when they see believers LIVING out their faith with love. We’ve got too many believers pointing out everyone’s faults instead of focusing on their own heart, and that type of attitude is a huge turn off to people like my husband who sees Christians as a bunch of judgmental hypocrites. rebecca,….i hope that i “may” be saying what many others here are thinkin,….when i say,….PLEASE KEEP HANGING AROUND HERE!!!!!!!! !………your last comment that i just saw was a conversation i had with someone earlier!!!!! almost 100% too!!!!!! !………….very nice words. lol,…i thought i already was following your blog???????? lol………..thanks much lady! God’s grace no matter how hard we try to explain it we always come up just a little short. God’s grace is just too high too deep, too long, too wide, with no beginning and no end. Pastor Joe you done one of the best jobs I have seen in a long time, thank-you. I love the part you wrote about praying for a lost love one. My father prayed many decades for me. My prayers go with you. Thank you, my friend. I praise God for giving me a second chance! Grace — God’s unmerited favor and God’s unconditional love. I’m thankful that God never gave up on me even when I had a crisis of faith. God stood with me through depression, loss, physical challenges and emotional problems. God never judged me and was always there to lift me up. He sent many people from all faiths, beliefs, races and backgrounds to help me. When I realized God loved me so much that he was not giving up on me, my faith increased. I still have many emotional challenges to work on but God continues to be loving, forgiving and compassionate. He sees I’m trying as all weaker vessels are trying. Yes Lord I’m gonna Straighten up and Fly Right. God opened my eyes, changed my perspective and attitude. Thank you dear God for helping me to let go of the past and move forward towards the future. Thank you Lord for your Grace. I have challenges too, so you’re not alone. 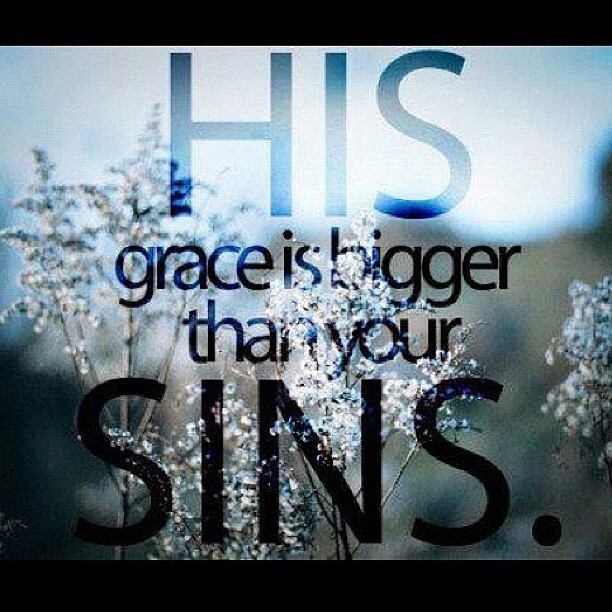 Thank God for His amazing grace! The gospel is so simple and it is completely summed up in the word GRACE. The hard thing is accepting it! Thank you for thinking of me. This is so right for my husband to hear. I am encouraged by how many times someone can hear The Word, then by His Grace finally really hear. I think of myself and others now found. I do continue to pray for all. I trust My Savior to do His Will not mine. At the least my husband and I are speaking to each other. That was something not thought of since Nov 2010. Thank you again. I am reposting in hopes he will read this or my daughter. You’re welcome, my sister. My prayers are with you! Thank you for the wonderful thoughts on grace!!! I am coming back tomorrow morning to read it again when I am more awake. I understand. I look forward to hearing your thoughts! OKAY JOE,….I ASKED IF I COULD SHARE AND COMMENT ABOUT MY “THOUGHTS” ON YOUR QUESTION OF,…”ANY THOUGHTS???? ?”,……but,…….picture me looking very, very, very, sad right now, ok????? ?…..You never answered me?……….So,…I can’t wait any longer (plus, I’m taking a break from drawing right now, so???) I’m doing the old copy and paste technique now…..you said,…. (A)…God’s grace is such a tough concept to wrap our minds around. (B)…It is so contrary to what we experience most of the time with other people. (1) What about Christians who live an immoral lifestyle? I’M GONNA COPY AND PASTE IN LIL’ CHUNKS, K??? (A)….As newborn babies,…we know nothing. Then,…lil’ by lil’, we learn as we go. (and grow) GRACE,…the word itself,…can be too easily misconstrued, or, misunderstood. it has some broad definition areas to it, doncha think??? The first time that I remember hearing the word “grace”,…was in a song. Yup,…You got it! AMAZING GRACE. “Amazing Grace, how sweet the sound,…That saved a wretch like me…. I once was lost but now am found,…Was blind, but now, I see. T’was Grace that taught…my heart to fear. And Grace, my fears relieved. How precious did that Grace appear…the hour I first believed. Through many dangers, toils and snares…we have already come. T’was Grace that brought us safe thus far…and Grace will lead us home. He will my shield and portion be…as long as life endures. When we’ve been here ten thousand years…bright shining as the sun. We’ve no less days to sing God’s praise…then when we’ve first begun. Other than that??? Well,….I memorized the first line, “uuuhhh uhhhhh UUHHH UH MAYYYY ZZZZING RACCCCCE….HUHOWWW SSSSWWEEEEEEETTT THUH SOUNDUH,….ETC…. And the other thing??? I was permanently confused by this line,… “I, once, was “Lost?? ?” but now, am “Found?? ?” was “Blind?? ?,…but “Now?? ?”,…I “See?? ?” Other than those two things??? The bagpipes made me feel like I should be part of a salute at a policeman’s funeral………. The “other” time that I “heard” grace? Yup. At the dinner table. With the “always accompanying” question of, “who wants to say “grace?? ?” (I honestly felt,…due to everyone’s hesitation, and trying to “pass” the saying of this “grace” to the “other” person, and so on,…that “grace” was something that i should fear!!!????) I gotta, also, say, “why do we call a “thanks” over our food,…as “being grace?? ?” (i was more than a “tad” confused, ya know???) Then, when I would “mix” the two together in my “kid mind”,…????? What did I see??? Well, not much. It’s a nice song,…but the concise definition of grace isn’t necessarily defined clearly, is it??? The (pride based???) instinctive/internal desire to “measure up”…..to be, “good enough”,…or to be, or “act” (ACTion…as a “verb”) as a, “good “Godly?? ?” person”, “should”….act or behave…”especially when seen or witnessed by “others” (humans, not God) external and/or, outward “motions” and “actions”…..etc,…..movin on now……. (#1)… What about Christians who live an immoral lifestyle? wwwooooooooeeeeeeee!!!!! Bold and brave questions right there!!!! Careful how we should even “dare” to touch those with a ten foot pole, huh???? lil’ lol……but,..in all seriousness. This is worth speaking about,…as long as it “can be done” in an encouraging (enlightening???) manner, FOR ALL INVOLVED!!!! And also, for “EVERYONE'”S BEST (IN AND THROUGH THE “EYES” OF FAITH) INTEREST! Simply put, “can and will” this topic, help others to grow??? NOW,…I ASK,….”Do you, “feel, think, believe”, that it is “possible” to keep this all around,…”encouraging?? ?” And “hopeful?? ?” And “freeing?? ?” etc, etc……..
My answer??? Based on “each”, and “every”,…”individual” having freewill to,” think” and to “believe”, and to “reason”, as we, “so choose to”,…IS,….YES!!!! and,….NO!!!! We can’t please every one, right??? Thank you. God’s grace is amazing! such a good message to focus on as i’m in england sharing Christ with kids. they won’t always accept him the first time around, but God will continue seeking after them. so great! Glad to hear! God’s grace is encouraging. Sometimes, we want people to make a decision for Christ the first time we present the gospel, but that does not always happen. God’s grace is so important for us to remember when sharing the good news with others. Press on, my brother! Thanks for this great article. I’m really inspired. You know, sometimes when we give our hearts to Christ, I wish we could use these words ‘Dear Jesus, I take you to be my lawfully wedded husband, to love and to cherish, until death BRINGS US TOGETHER’. There’s nothing compared to the love of Christ in our lives if we yield all to Him. Thanks for this post. I believe that faith and works go together, but the works are not for earning salvation, they are just the natural result or “fruit” of the faith. I like what you said about ‘even if we do nothing to serve Him, He will still love us’. Even if we sin all the time, nothing we do can make Him not love us. But we do need to choose to accept His grace and love. I also like what you said about all the people involved in one person’s conversion. Our prayer is so powerful. Now I have a little joke with myself. If someone is rude to me about my faith, rather than arguing about it, I take revenge!!! My revenge is loving, forgiving, peaceful prayer for their conversion!!! number one,…..as saved people,…..jesus is the vine,…and through our faith,….we are the branches. number two,…….how does it go,..???? if we continue in sin,…we crucify christ afresh, and put him to open shame????? is that correct????? i shall return to see what you have said,…..much love to ya!!!!!! have fun!!!!! Just checked out your site and I really do like it. I feel the spirit of God in your words. I know that God is a part of this blog site. His presence is felt here. Thanks for stopping by my blog site also. Thank you, Debra. God bless you always! Thanks for the reminder Joe… God’s grace is sufficient and as such we should always extend the opportunity of salvation to others. God bless you!! This is wonderful Joe. I must reblog this. Thanks for visiting my blog as well. Thank you, Sisbeejay. God bless you always! Thank you, Tracy. I appreciate all the comments you are making. God bless you always! Thanks for all your posts Joe! They are a blessing to me. Thank you, Anthony. God bless you! All it means is that if you have faith, you will naturally want to serve God, in other words, as it says in Matthew’s Gospel: “By their fruits you shall know them.” I have heard people say “I am saved” but they continue living in as much sin as before, and “justify” it by saying they are saved by grace. We are all sinners (me most of all), but we at least should try to do God’s will. Hi Joe, I pray that all is well with you. parishioners and explain the bible as written. The church’s teachings are not biblical. I told her there are two factions or sets of people, the Saved and the Unsaved. I And that Jesus did not come for the righteous. (I did not say ..( Catholics..as they say they are the only true church and the only saved people.) according to their teachings. How can anyone explain anything biblical to them, when they only believe in themselves? to open up their minds and eyes, who are not inclined to see outside their circle of friends and religion. the righteous and nobody else will go to heaven, but them. I agree with most of this..We as Catholics believe in Purgatory..And, if Purgatory could be the place that keeps a person from Hell..then, it must be a good place. We will not know the full extent of everything we are taught until we reach our Eternal reward. I see the person above is completely misinformed about what the Catholic Church teaches and believes. First of all there is no such thing as the Catholic Religion as separate from Christianity. It is simply the original Christian Church which preserved the Bible and brought the faith to the world. Other churches only started branching off after 1,500 years. Christianity did not start in the Reformation. The Catholic Church does not teach that only Catholics go to Heaven, nor does it teach that we can save ourselves by works, instead of relying on the grace of God. Before making judgments about what a church believes, try going to its Bible study classes, or reading what its theologians write – I recommend anything by Scott Hahn, who hated the Catholic Church so much that he decided to find out more about it, and as a result found himself called by the Holy Spirit to become a Catholic. I’m sorry. Do I know you? I was leaving a comment for Joe. Church. I was speaking about my Sister. in my comments above. I was not speaking about myself. churches hold bible study but many people do not learn what their own religion means. organization teaches. Anything taught outside of the bible is false teaching. Sorry Joe. Hope all is well with you and your family. Jesus Christ, and by faith in the Gospel of Jesus Christ we are saved. the sacrament is not wrought by the righteousness of either the celebrant or the recipient, but by the power of God. This is in complete agreement with this article that we rely not on our own merit but on the grace, mercy and power of God. Through the history of the ROMAN CATHOLIC CHURCH a major point of emphasis has been that union with the Roman Catholic Church IS ESSENTIAL TO SALVATION. “There is only one universal church of the faithful, OUTSIDE – WHICH NONE WILL BE SAVED.” This was reaffirmed by Pope Bonifae Viii . IT IS TO BE HELD AS A MATTER OF FAITH – NO ONE CAN BE SAVED OUTSIDE THE APOSTOLIC ROMAN CHURCH. It is the only ark of salvation and anyone who does not enter it must sink in the flood. as a mystery of sacrament” and the conception of the church as a hietrarchial institution was replaced by a view of the church as “the whole people of GoD. THIS TOO IS BLASPHEMY, AND FALSE DOCTORINE. The priests and bishops and the entire hierarchy set themselves up as Christ Like. ALL OF THE GRACES WHICH GOD ACCORDS US ON ACCOUNT OF CHRIST’S MERITS COME TO US DIRECTLY OR INDIRECTLY THROUGH MARY. Worshiping anyone other than God, The Holy Spirit and Jesus Christ is denying Christ and the Holy Trinity. THERE IS NO CHURCH THAT HAS DEITY, AS THE CATHOLIC CHURCH STATES IT HAS. BECAUSE OF THE RESURRECTION OF JESUS CHRIST, THE APOSTLES EYES WERE OPEN AND THEY WENT OUT TO PREACH SALVATION BY BELIEF IN JESUS CHRIST, NOT A CHURCH. We can only be forgiven by Jesus Christ, who died for forgiveness of sins. THERE IS NO MAN WHO CAN FORGIVE SINS, NO MAN WHO CAN SAVE OTHERS. We are under GRACE which means unless we receive Jesus Christ as our Savior, we are doomed eternally. It is a Free gift of God to have faith in His Son, Jesus Christ. There are no stipulations, no rules, laws, sacraments , council or anything else governing the work of Christ on the Cross. Christians do not worship Saints or false gods or idols or priests or popes or any other thing but God, Jesus Christ and the Holy Spirit. CHRISTIANS ONLY HAVE ONE GOD, ONE JESUS CHRIST AND ONE HOLY SPIRIT. Nothing on earth is worthy of the worship of mankind, but the HOLY TRINITY. The WORD CHURCH MEANS CHRISTIANS WHO BELIEVE IN JESUS CHRIST. IT DOES NOT MEAN A BUILDING. BAPTISM DOES NOT SAVE ANYONE. PAUL EMPHASES THE BAPTISM OF THE SPIRIT (HOLY) not the baptism by a person in a church. NO PERSON CAN BAPTIZE.The spirit baptizes the sinner, when he is saved and professes his belief in Jesus Christ as Savior, and believe Jesus Christ, Gospel, His Death, Burial and Resurrection. A CHURCH WHO TEACHES THE LAW OR HAS ITS OWN TRADITIONS AND ADDS SCRIPTURE TO THE BIBLE, IS A CULT RELIGION. IT IS A FALSE TEACHER. A HOT IRON. Christians follow the New Testament, as the law was broken with the Resurrection of Jesus Christ. There are 67 Books in the Bible. ANYONE TAKES AWAY FROM THE WORDS OF THE BOOK OF THIS PROPHECY; GOD WILL TAKE AWAY HIS SHARE IN THE TREE OF LIFE AND IN THE HOLY CITY, WHICH ARE DESCRIBED IN THIS BOOK.” Harper Study Bible, Revised Standard Version. against the truth of the Bible as written by God. It is quite tempting to reply to every point you make, but as I dont believe in arguing about faith, I will simply say that the Catholic Church teaches everything that you have said you believe in, and would only disagree with the judgments you have made about it because of your misinterpreting of its beliefs. I pray that you and I, and all Christians, and all people are led by the Holy Spirit into a deeper truth and knowledge of the Holy Trinity that all we Christians worship exclusively. offer salvation, but one man, Jesus Christ. The Bible is clear on these scriptures and reading them on a daily basis, increases wisdom and knowledge in us, so we can go on to testify to others and help them in their journey. Blessings to you and your quest for knowledge. Then Jesus came to them and said, ‘All authority in heaven and on earth has been given to me. Therefore go and make disciples of all nations, baptizing them in the name of the Father and of the Son and of the Holy Spirit, and teaching them to obey everything I have commanded you. And surely I am with you always, to the very end of the age’” (Matthew 28:18-20). AND INDWELLS each believer. SALVATION IS THE WORK OF THE TRINITY, (Father, Son and Holy Spirit) as stated in Titus 3:4-6 and 2 Thess 2:13,14. Jesus was speaking to the Apostles whose eyes were opened at His command. They went forth to preach the Gospel of Jesus Christ in Romans 10:9 “For with the heart, one believes and thus has righteousness, and with the mouth, one confesses and thus has salvation.” This is all that is necessary to be saved, a saint and a child of God. The blind are lost and the born again in Jesus Christ are redeemed and live to serve Jesus Christ, not man. May you be blessed by these words, and find salvation through faith in the only begotten Son, Jesus Christ. Once again you are preaching to the converted. I thought you were Catholic. What does converted mean? every time a person WITNESSES TO OUR SAVIOR, JESUS CHRIST. When i write, it is not necessarily to reply to a comment in this blog. we too are messengers, ministers and prophets for Jesus Christ. When we talk about faith, it should be witnessing to our Saviour Jesus Christ. It should be full of love, humility, truth, wisdom, peace, faith and hope. See both I Corinthians 12 and 13 – too long to quote here. Hi, Im sorry I dont know anything about Joes whereabouts…Maybe hes just busy. Thanks for the good wishes and blessings. Hello Pastor Joe! Thanks for following my blog. I am knew to this arena. I’m happy to have found a place to share the gospel with people I will probably never meet in person, but to be able to still encourage their faith, or boost their lack of faith is what this blog is all about. Feel free to stop by once in awhile when you have spare moments to check out my posts and comment to keep me in check if necessary lol. God bless and once again thank you! lol Absolutely Dave! God bless!